Symphony No. 1 “Low” was commissioned by the Brooklyn Philharmonic Orchestra. In January 1992 Philip Glass turned 55 years old. It was at this time that Glass received a commission from the Brooklyn Philharmonic Orchestra and its principal conductor Dennis Russell Davies for what turned out to be Glass’ first symphony. Glass tells the story of Davies, at that point in Glass’ career of “not letting him be one of those opera composers who never writes a symphony.” The Symphony was composed in 1992 and scored for full orchestra with 2 flutes, piccolo, 2 oboes, 2 clarinets, E-flat clarinet, bass clarinet, 2 bassoons, 4 horns, 3 trumpets, 3 trombones, tuba, percussion, harp, piano and strings. The piece is in three movements: I. Subterraneans, II. Some Are, and III. Warszawa. 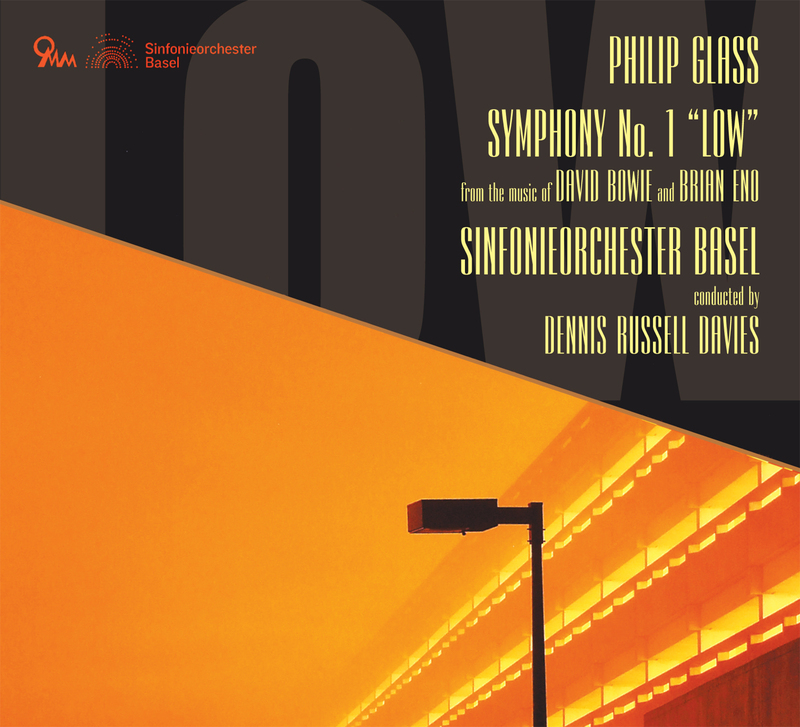 Glass selected these three original sources for the Symphony, varying only slightly by using a track, “Some Are” that was not on the original “Low” recording, rather it was a bonus track on the 1991 Rykodisc reissue of the Bowie Low album. The first recording of the Glass work was released in 1993 under the title Low Symphony. It was performed by the commissioner, the Brooklyn Philharmonic orchestra under the baton of Dennis Russell Davies. 1992 was an interesting point in Glass’ career to compose this piece. After obtaining his Master’s from Juilliard in composition in the late-1950’s, in the early 1960’sGlass went to work as a composer-in-residence in the Pittsburgh public school system. The ever prolific composer wrote all sorts of works at this time for orchestra including a violin concerto, divertimenti, and other works in the classical tradition. These pieces have all been discarded or disavowed. It was only after Glass’ time in Paris in the mid-1960s that he developed his first vocabulary as a mature composer; this would be the music that most people associate with his own unique compositional voice starting in Paris in 1965 with the incidental music to Samuel Beckett’s Play. Shortly after Paris and travels in India, Glass returned to New York City and made his debut with his new music at the Cinematheque in May 1968. But this was early solo music or music for his own group The Philip Glass Ensemble. It would be only years later with the commission for his second opera Satyagraha that the composer would write for orchestra again. So for almost 20 years between the his “Pittsburgh” pieces in the very early 1960’s until the Satyagraha premiere in 1980 that Glass did not write for orchestra. Keep in mind that in 1980 Glass was well into his mature music and in a rich period of discovery within his own post-Einstein on the Beach style. One can see in pieces like Koyaanisqatsi (1981) and the opera Akhnaten (1983) that Glass had very clearly begun move away from the sounds and instrumentation of his own ensemble (woodwinds, keyboards, voice) to enjoy the wider palette of the what the orchestra offered and to bend his musical voice to work well within the medium. It was by no means a given that Glass’ musical language would work so well for orchestra. Writing for the opera house greatly prepared the composer for writing concert music though with one big difference. When writing symphonies the language of music is the subject of the work. When writing operas the subject of the opera is the subject. In writing operas a composer is given weeks of rehearsals to work on the music and usually a generous amount of orchestral rehearsals. By contrast, in modern times a composer is lucky to get a complete read through of his new concert work before its premiere. With the experience of writing so many operas before attempting to compose his own first symphony Glass had the benefit of lots of experience with the orchestra as well as writing in long-form. So what begins to emerge is a composer who started with a classical musical formation who over time gained new interests and opportunities in the theater, whose questions about the language of music found a home and a certain usefulness of the form of the symphony as a receptacle for some of his most intense musical discourse; Glass is a composer who started with absolute music, moved into theater, and has returned (to a certain extent) to “absolute” music. Certain tendencies of a theater composer do inform many of his concert works. With his Symphonies Nos.1,2,6,7,8, and 9 we see a trend of writing in three movements, not far in form from the feeling of the three acts of a theater work. Symphonies Nos.1,4,5,6, and 7 all have extra-musical materials, texts, or other allusions. Symphonies Nos. 1,2,3,4,8,9, and 10 are purely instrumental works. This recording by the Sinfonieorchester Basel and its music director since 2009 is an astounding accomplishment. In the 1993 studio recording the musicians were recorded sectionally and performed to a click-track. This recording was made live at the Stadtcasino Musiksaal in Basel with the Sinfonieorchester Basel. To put it simply, Davies and the orchestra bring the music to life as it has never been heard before. But it all started in 1992 with the Brooklyn Philharmonic ‘s commission of Low Symphony. At age 55 Glass could have no idea he’d have the opportunities to create such an elaborate body of work in the medium. Now 20 years later, starting a new relationship with a new orchestra, the Sinfonieorchester Basel, Davies decided to go back to he beginning of his symphonic collaboration with Glass and make his first recording with what we now understand and recognize as Glass’ Symphony No.1. Philip Glass’s music is published by Dunvagen Music Publishers, Inc.